Try cutting an onion without shedding a tear and you will do something that is almost impossible. In the recent weeks Indians have been trying to hold back their tears while looking at rising onion prices. Because of bad weather conditions for cultivation onion production declined and caused a spike in market values. The regular market price of a kilogram of onions has been 100 Rs/kg. 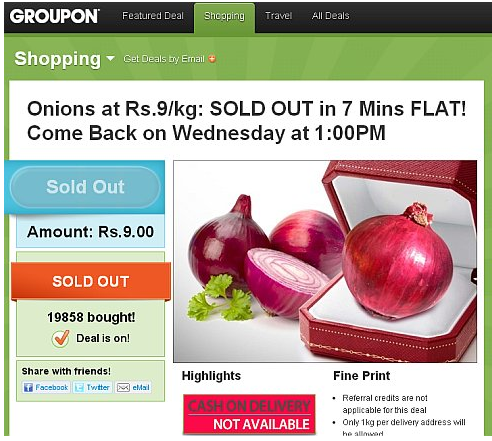 So when Groupon in India unveiled an unimaginable deal, only 9 Rs/kg for onions, the Internet went crazy. 17,065 users flocked to the website and bought over 8,000 kilograms of onions. About 3,000 kilograms were bought in just 44 minutes. The chief executive of Groupon in India, Aknur Warikoo, said that he wanted to sell onions at a price most people have forgotten about and he achieved his goal. The last time this treasured vegetable in Indian cuisine sold for this price was in 1999. The ‘too good to be true’ deal created so much frenzy that it crashed the website for about 10 minutes. Those who managed to buy the deal before it sold out were definitely happy customers. They could finally use onions in quantities their traditional recipes called for and serve the dishes on their family tables. Although this might be the first time that onions have been sold on the company website, it definitely won’t be the last. Considering changing weather patterns, rising food prices and demand on good deals Groupon might have found a new niche for selling discounted produce to their customers. And while such deals can help alleviate certain problem temporarily they can’t help build a strong agriculture for the future. This is why we need to rely on the swift and intelligent actions of the government to create laws that take into consideration rising temperatures, droughts, depleting resources and a stronger focus on local food production. This will help strengthen small neighborhoods, create jobs and ensure that good food isn’t wasted due to long transport hours and conditions. If the government fails to address our agricultural future then maybe one day Groupon will become our number online supermarket. Posted on September 12, 2013 by saynotofoodwastePosted in NewsTagged drought, Groupon, onion, price.